I don't know what location prompted this thought form Gerhard, but it doesn't matter; this kind of "provision" is quite standard for both pedestrians ands cyclists all over the UK, outside towns and cities. It's a most bizarre thing in the context of a so-called "civilised" society, and it put me in mind of a bike journey I made just before Christmas 2011, and a blogpost I had started to compile based on that, which had remained incomplete. It was written to demonstrate the typical problems a cyclist will encounter when travelling across the green belt between the Shire suburbs and outer London. Here it is. The journey in question was from Elstree to Edgware, on the north-west fringe of Greater London. 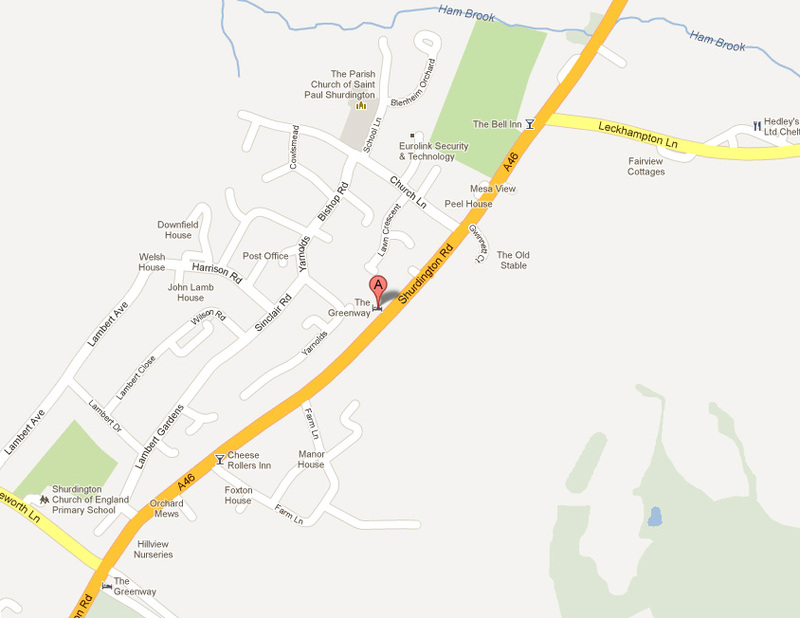 The journey is entirely on this map. The photos below are more than a year old, but I do not expect anything of significance has changed. 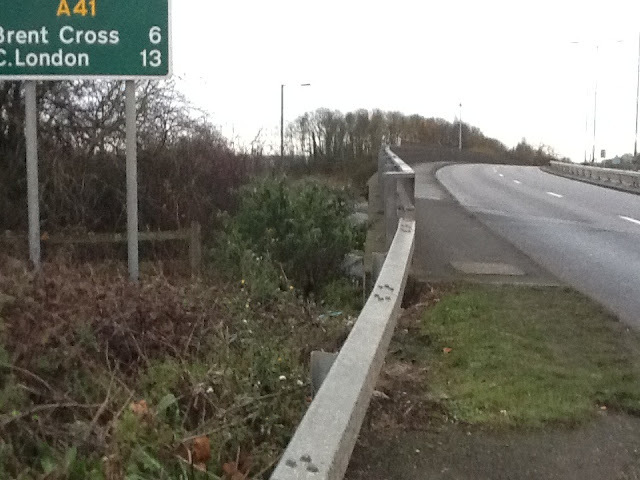 Does this mean cross the dual carriageway to the other side to continue? I thought about this for a while before deciding it does not. The route continues on the pavement to the left. 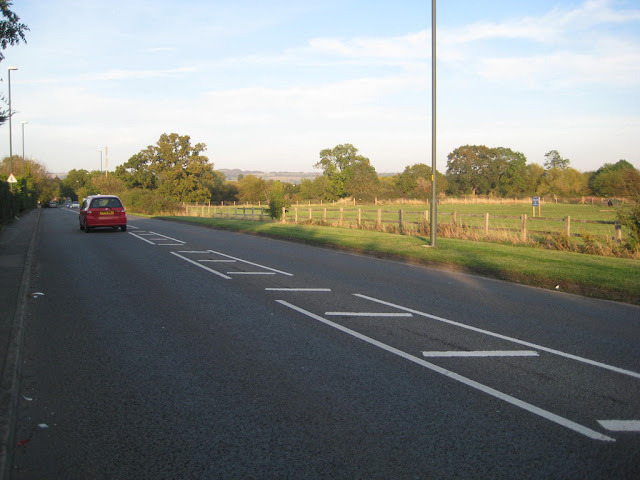 Note the spacing of the bollards to prevent smooth cycling. Following the shared path further we now skirt the roundabout connecting the A5 and the A41. 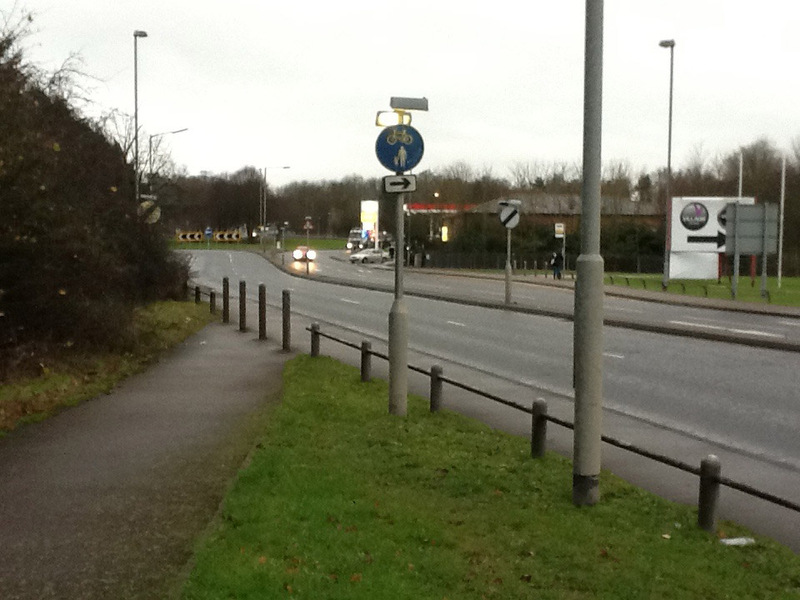 There is no safe way to cross this roundabout to continue south on the A5 (Brockley Hill) should you wish to (for example to access the Royal National Orthopaedic Hospital). 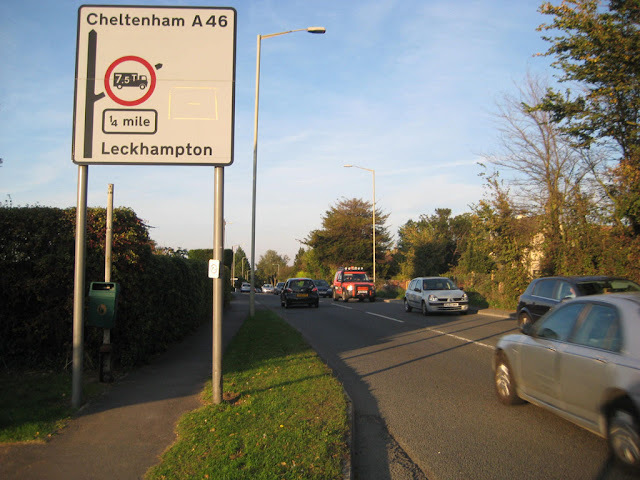 If you are heading towards London, however, I wouldn't advise using Brockley Hill anyway, as it is a very narrow road with a 40mph limit and a very steep (downhill) gradient. The view of London is impressive, but you don't have time to enjoy it as the ride is too hairy, with trucks whistling past you at 40mph, as you do about 25 on a poor surface, with a hairsbreadth to spare. No, what we are looking for is the cycle track alongside the A41 Edgware Way. But getting a little bit higher on the bridge, and things start to look puzzling. The path becomes gravely or covered with grass. Can this really be the way? This is the no pedestrians sign. 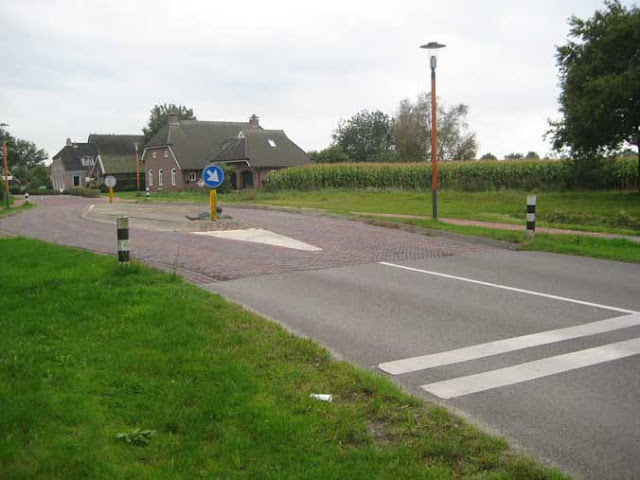 It means that people should not continue walking on this side of the road, so, ergo, unless they are supposed to turn back, this is where they must cross the road. 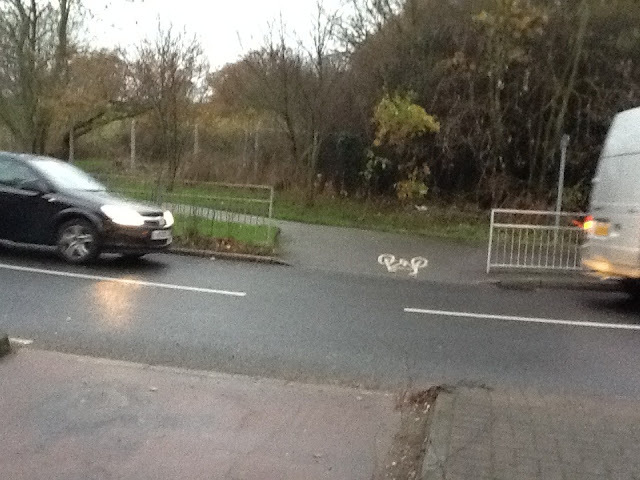 And, since it is a shared facility, this must be where cyclists cross as well. Is that all absolutely clear? No?? The "ahead only" would apply to any cyclists brave enough to head into the A5–A41 roundabout, I suppose – so this constitutes the totally unclear instruction for cyclists going the opposite way to me, heading for Elstree via the cycle route, to cross the road. 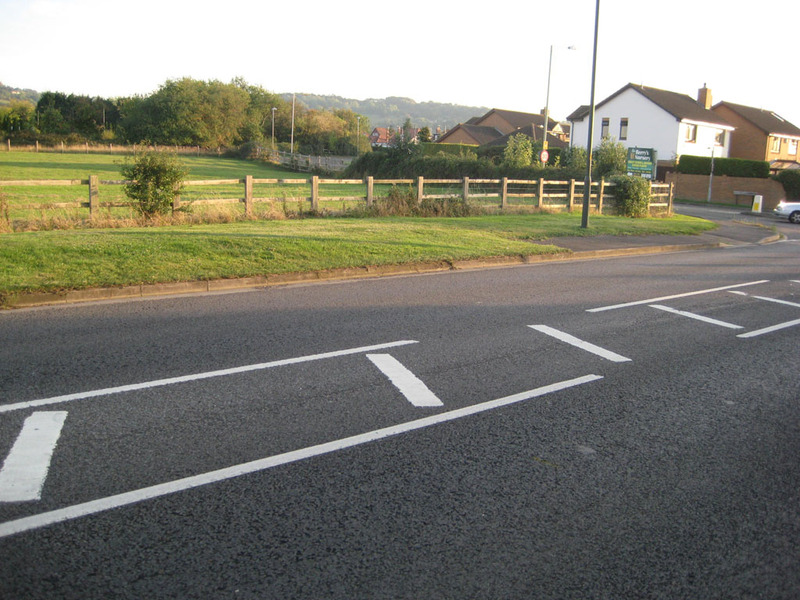 And, in the unlikely event of a cyclist coming from the roundabout encountering a cyclist going towards Elstree on the cycle route, they are supposed to give way, indicated by the "toytown traffic" give-way lines here. I am sure that in reality, should two cyclists meet here, they could negotiate without these markings, but someone though these strange junction markings at what is not much of a junction were needed, rather than the more obvious thing, which is an arrow or sign to instruct cyclists heading for Elstree to cross the road. The markings here manage to be a mixture of the unhelpful, the incomprehensible, and the unnecessary. 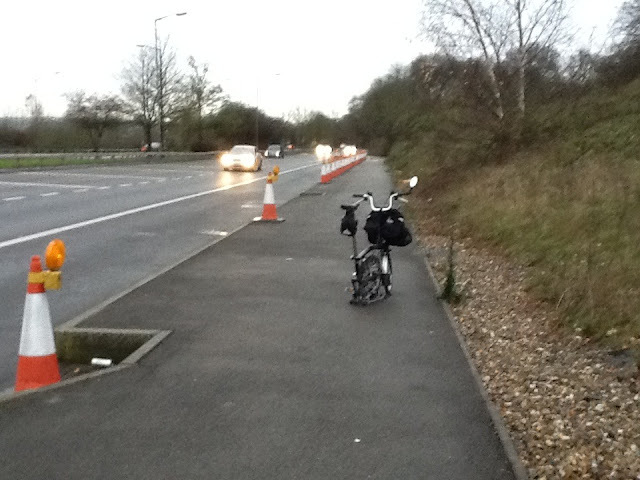 This ghost bike is tethered at the point where the slip road to join the M1 north-westbound diverges from the A41. Cyclists are required to cross the 70mph slip road here, with no more than a "look left" and their own judgement to protect them. 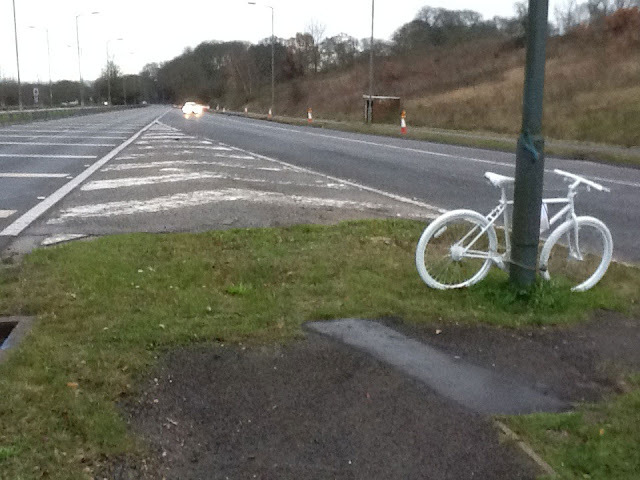 This is the ghost bike for Zoë Anne Sheldrake, killed at the age of 31, on 26 April 2010, at this spot. Ghost bikes are not normally allowed to remain long at their installed location by the authorities, so I am surprised this was still here, 20 months later, seen by every motorist who drives northward on the A41 Edgware Way. I can only assume that Transport for London or Borough of Barnet inefficiency or oversight is responsible for longevity of this one, or possibly doubt about responsibility, as it is very close to the Hertfordshire border. 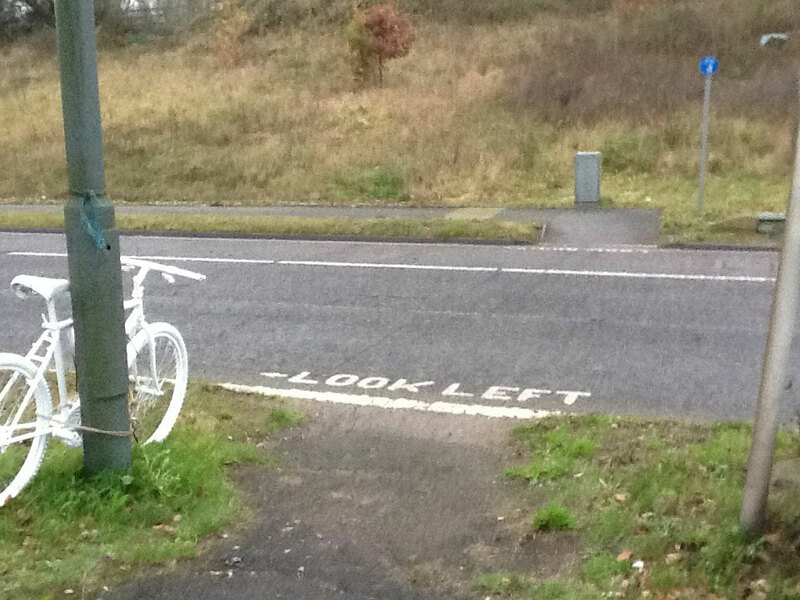 Whatever, this must be the longest-lived London ghost bike, standing in this incredibly bleak location. 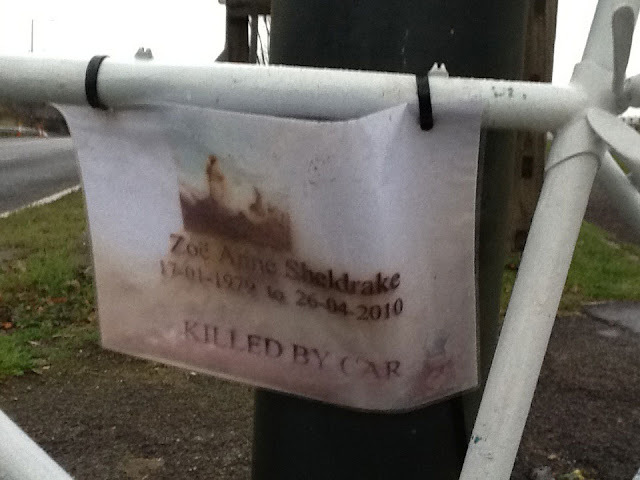 The piece of paper attached to the bike is still there, giving Zoë's dates and the statement "Killed by car" – though "killed by criminally irresponsible road design" might have been more appropriate. 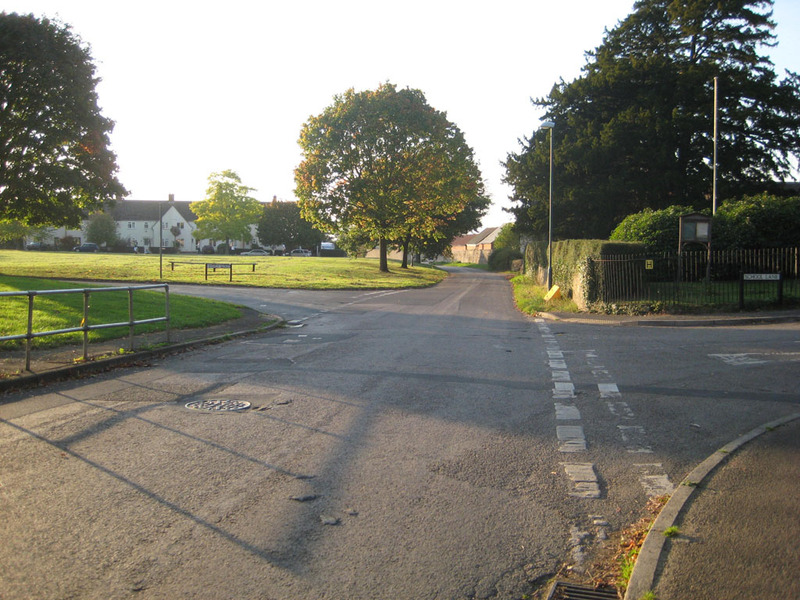 The driver who hit Zoë, Clive Sanford, was found not guilty of causing death by careless driving (by a majority verdict) on 8 September 2011. Mr Sanford – who had denied the charge – cried as the verdict was announced, while members of Ms Sheldrake's family screamed and shouted in the courtroom, labelling the decision “disgusting”. 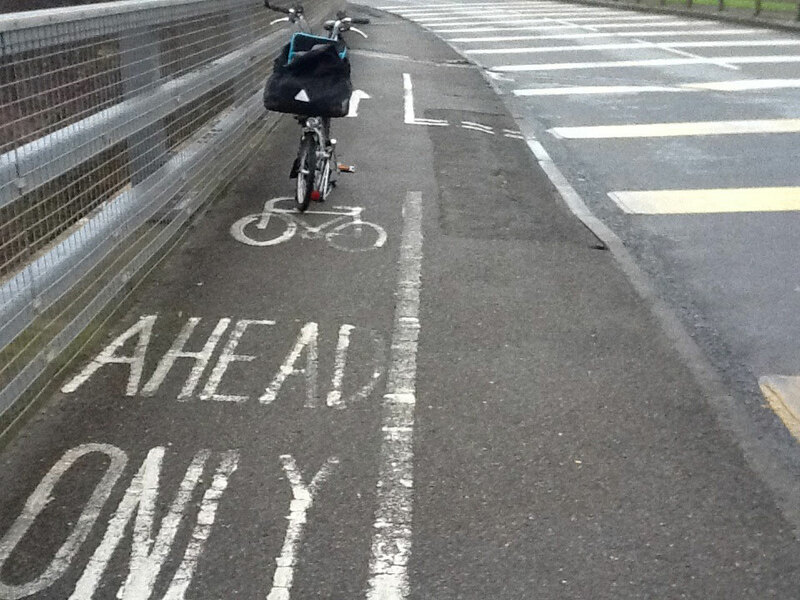 An understandable reaction, but what is really disgusting is the design of this cycle path. 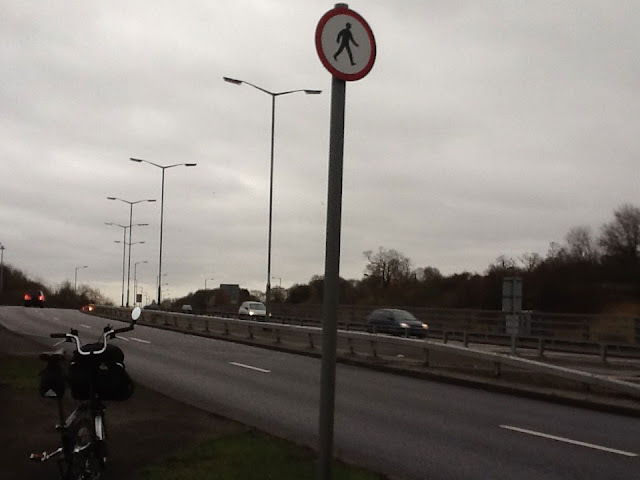 The London Cycling Campaign made a video and webpage about it, calling it "The most dangerous cycle crossing in the UK? "– which it could be. They point to the facts that there is not even a sign telling motorists that cyclists and pedestrians are supposed to be crossing the slip road here, and that motorists can at the last moment change lanes into the slip road, when they are almost at the crossing, without giving any indication. Possibly this is how Zoë died, I don't know, I cannot speculate reasonably from the information I have seen. I have made my own video of the junction. This shows quite long gaps in the traffic, but remember this was taken on a Sunday near Christmas. At a busier time it might be far harder to get a substantial, certain gap in the flow. 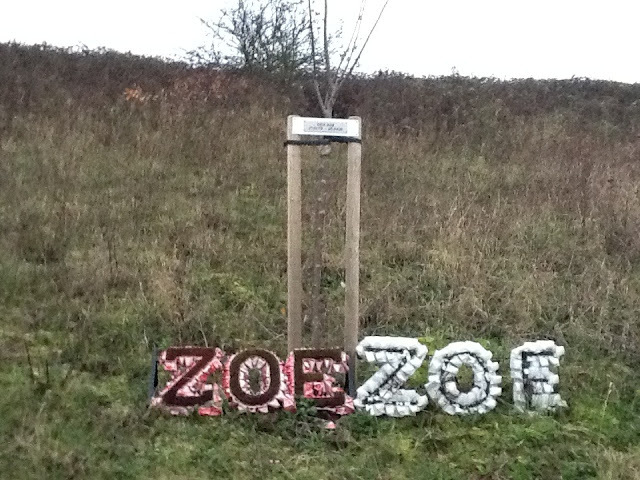 Reaching the path on the west side of the A41 to M1 slip road, and proceeding slightly south, we come to another memorial still extant (in December 2011) to Zoë. Note again the general lack of clarity that bedevils these things. 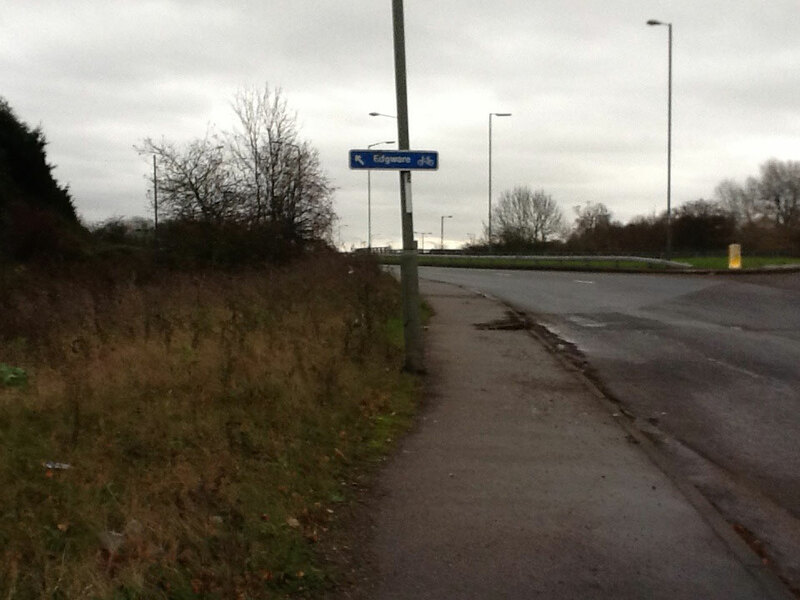 The cycle route crosses the road here and comes from the right. The pavement to the left is not for cyclists, but nobody would know without looking at the TfL map. 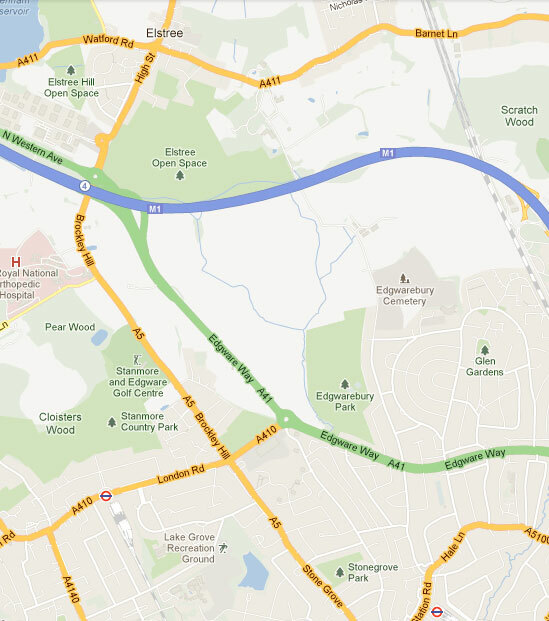 This shows that official routes continue on the south side of Spur Road westwards, and on the south side of the A41 Edgware Way (Watford By-Pass). Edgware Town Centre can be more easily accessed however by a yellow (unofficial) route marked on the London Cycle Guide via Green Lane: a long, straight residential road that has low traffic because it is closed at its far end, at Station Road (a road I have blogged about already). And here's the reality: minor roads chocked with parked cars. 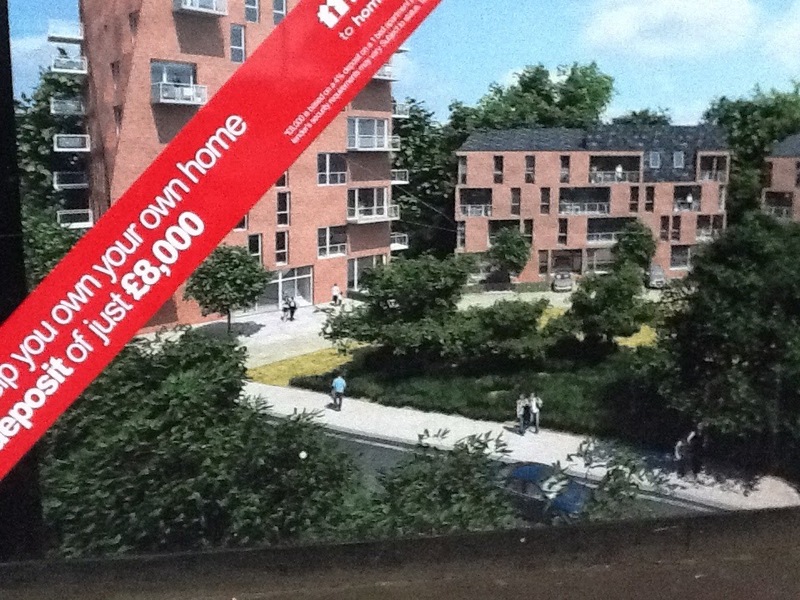 The Borough of Barnet is now having areas like this developed at high density, which should imply low car ownership, but the street environments outside the small envelopes of development land are not changing. They are still laying out the street environment exclusively for the convenience of car drivers, with nothing to make cycling and walking pleasant or attractive. 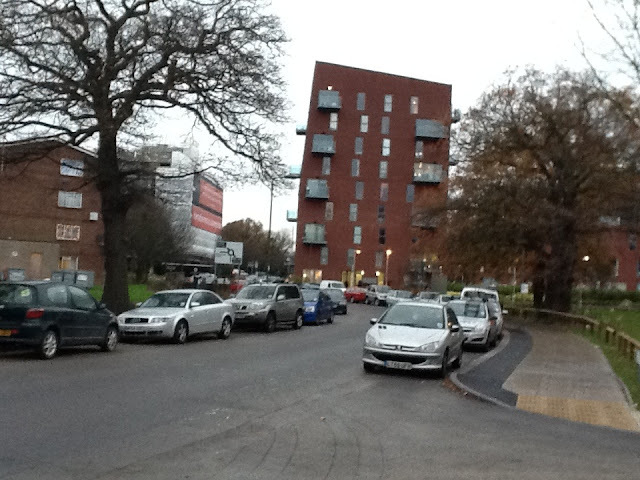 So architects' visualisations like the one above always turn out to be remote from reality. Here endeth the journey. 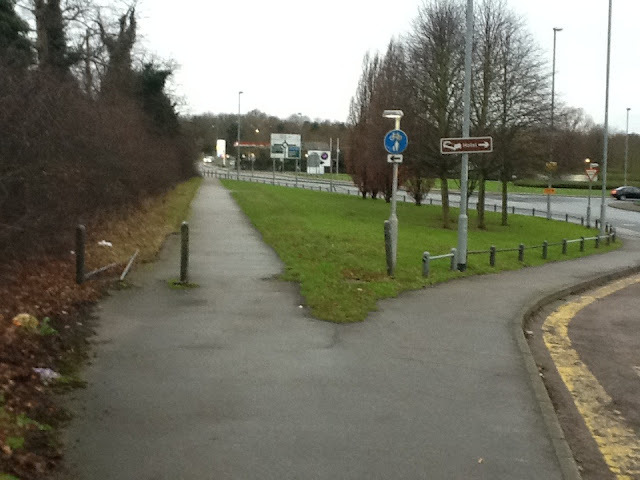 As we see, the facilities for cycling on this potentially important corridor across the green belt just to the north-west of London are the usual tragi-comic mess characteristic of such facilities on the edges of UK urban areas, where small roads like Green Lane run out, and cyclists have perforce to be directed around 70mph roads and motorway intersections, in the cases, that is, where any thought has been given to them at all. You can find this kind of thing all over the country. 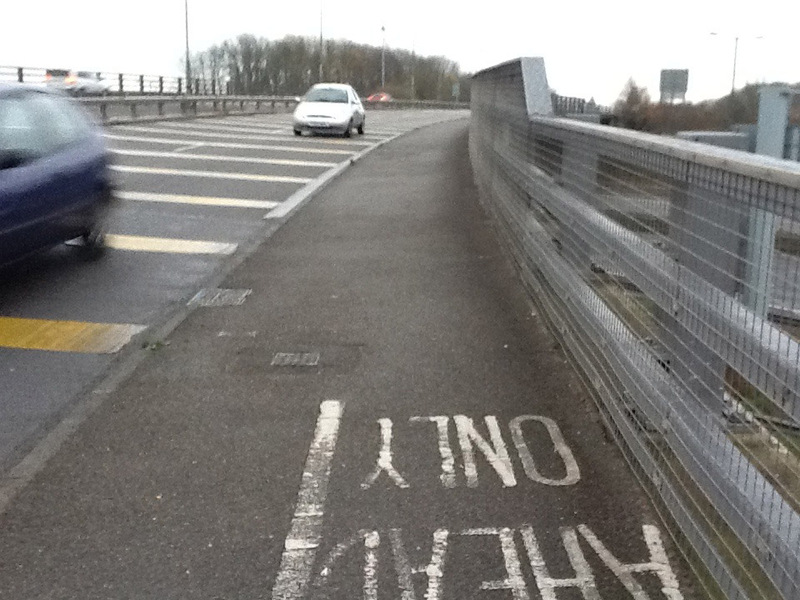 There are exceptions, such as the Bristol to Bath National Cycle Network path where it enters Bristol on impressive bridges across the peripheral motorways and junctions, but these exceptions are, as my late friend Patrick Moore would have said, "as rare as hens' teeth". 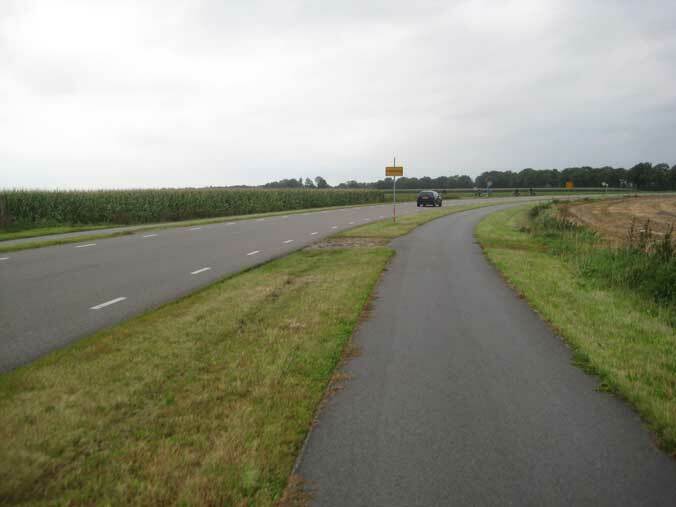 The most serious problems occur where motorway-level roads have to be crossed, but there is no will to actually engineer for cycling (nor often for pedestrians either). There seems to be just no solution in the UK's current transport regime to the kind of issue that killed Zoë. For cycling and walking levels in these places are very low; as has been truly said, you do not measure the need for a route by counting the number of people who are walking through a wall. Highway Authorities see it as an unreasonable demand that millions of pounds be spent retrofitting bridges and tunnels into roads and junctions that don't cater for cycling or walking because of what they perceive as the low level of demand. But it is on the shoulders of the Department for Transport that the blame for this must mostly be placed, for setting policy guidance and funding levels, and determining the general spirit of things, In a letter to the Cycling Embassy of Great Britain (not published) that I have seen, the current Secretary of State for Transport says exactly this, in terms. He says he's not prepared to spend serious money on engineering for cycling, as continental countries do, because we have so few cyclists. And so we have a totally diagraceful, inhuman situation that kills people and stifles attempts to get sustainable transport off the ground. 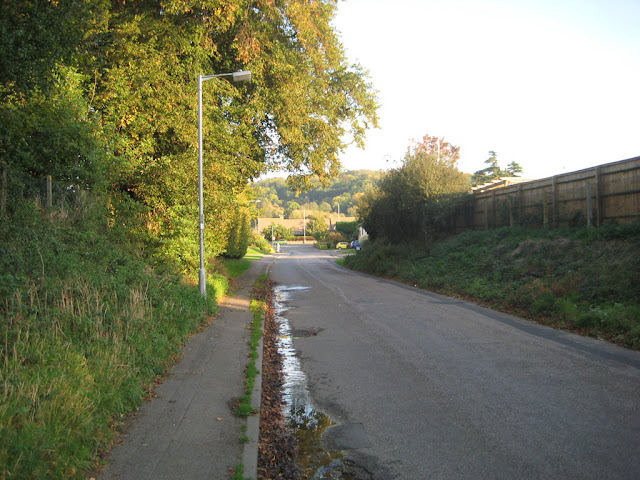 The only hope seems to be in the few cases where Sustrans, a charity, can raise enough money to build something proper, as they did at Bristol. 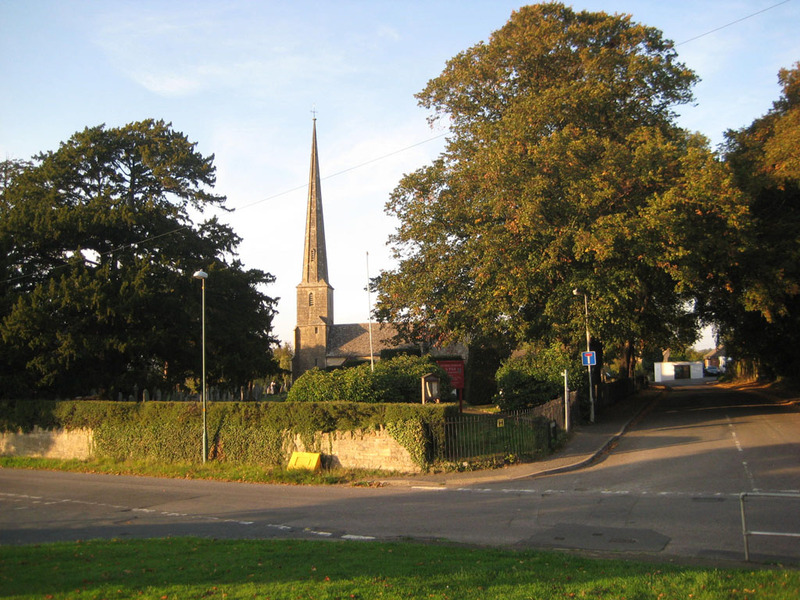 In terms of basic safety of sustainable travel modes, we in the UK are not in the position we were in for poverty relief when the welfare state was created, not even in the position we were in during the era of the Victorian Poor Laws; we are in a mediaeval state of having to depend on charity. 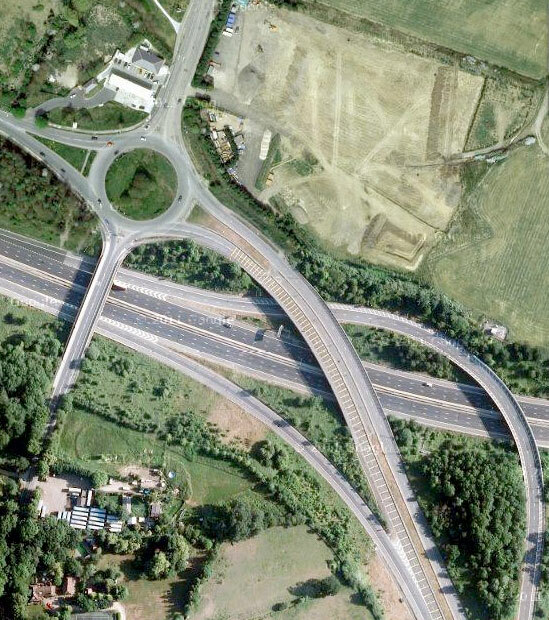 Here's an aerial view of the M1-A41-A5 junction that shows it more clearly than the map does. 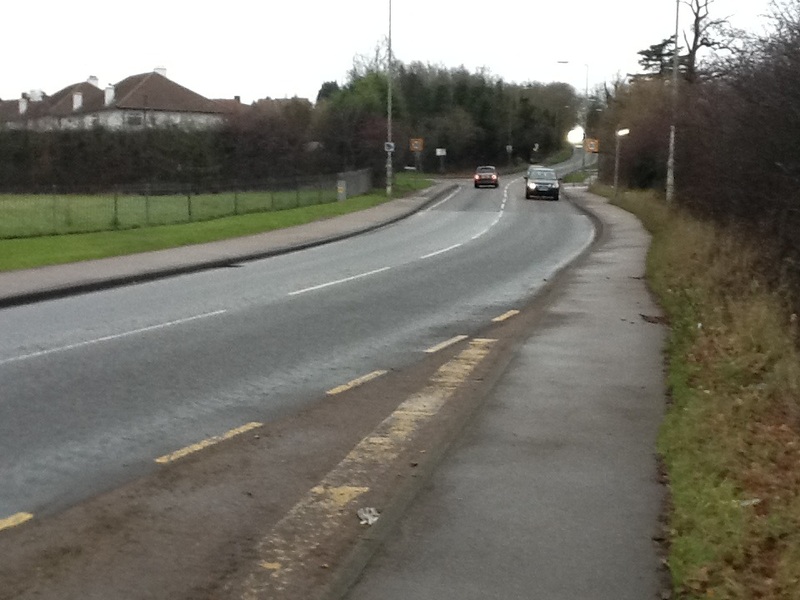 The problem is that cyclists have to be got from the road at the top, Elstree Hill (both sides) to the two-way cycle path on the west side of the slip road at the bottom. 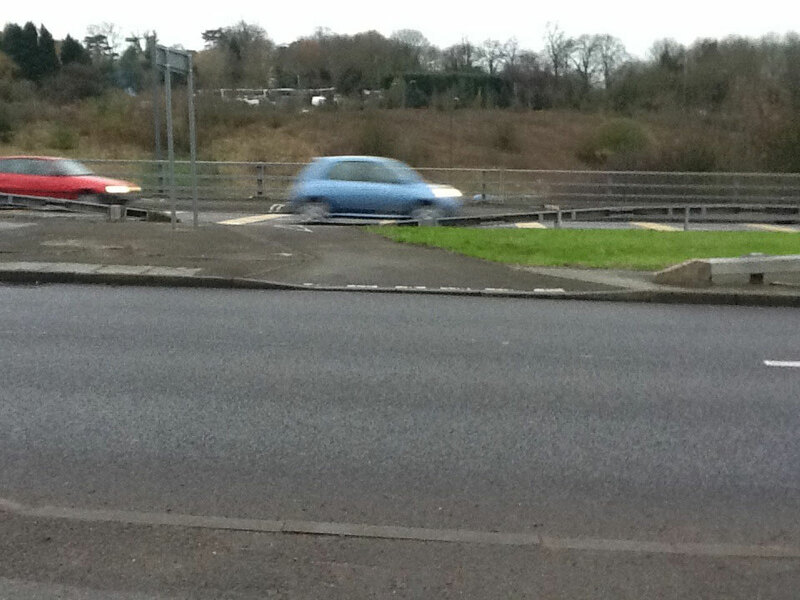 It can be seen that the roundabout is at a high level, and the M1 is in a cutting. With the very high traffic levles and designs speeds, I don't think any surface level treatment for a cycle route is going to work here. Nor would it be reasonable to expect it, at a crucial node on the national road network. The best solution looks like building ramps and underpasses to take cyclists under the roundabout, and then on to a new, dedicated bridge over the motorway, parallel to the existing A5 bridge on its east side, to end up on a new cycle path on the south side of the motorway slip road that would follow round to connect to the existing path at the bottom right of the picture. I've no doubt this engineering would run to tens of millions of pounds. But it's clear and straightforward, in principle easy (plenty of open space), and it's what the Dutch would do. But with the current levels of funding for cycling infrastructure we simply cannot do this kind of thing. We need a step-change in funding, as I argued recently. What's the alternative? 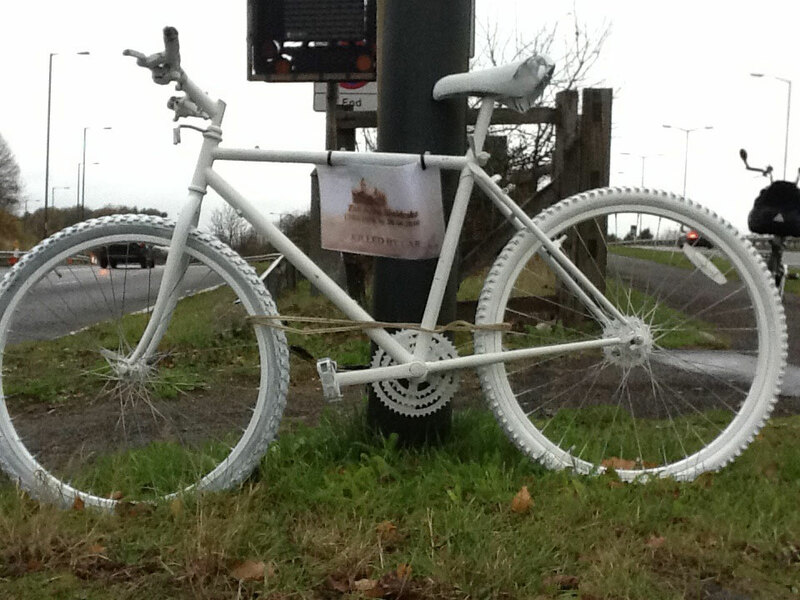 A steady stream of deaths, and practically zero cycling in such city fringe areas. We tend to concentrate, in our thinking on cycling in the UK on town and city centres. But unless we can solve these urban edge locations as well, we'll end up with, at best, a few inner-city city cycling enclaves, but still at very sub-Dutch cycling levels, and not with any kind of national transport cycling culture. 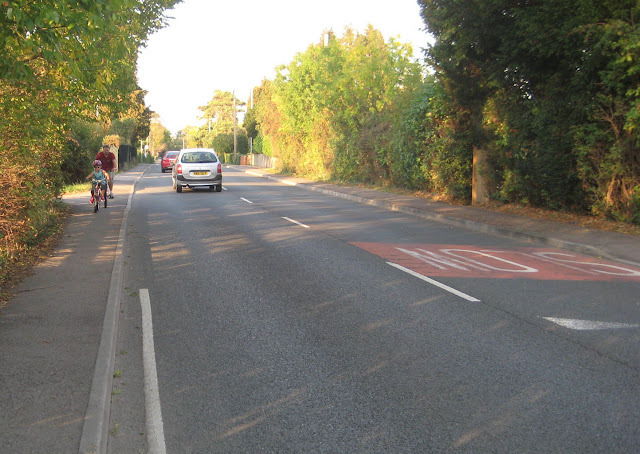 For cycling to be a serious transport option, it must be possible to get safely from A to B anywhere. This Christmas, remember Zoë Sheldrake, and all others killed on the roads of Britain, just for trying to get around on bikes.